Proper nutrient management is the single most critical factor in a successful growing and production program. TotalGro formulas are based on scientific research and testing. TotalGro products are unmatched in quality and performance. 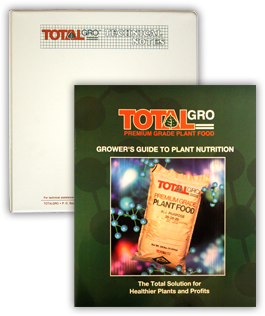 All TotalGro formulas are high-purity, water-soluble fertilizers designed to be used for greenhouse fertigation of ornamentals and flowers, nursery production, and field fertigation and production of things as diverse as tomatoes and strawberries. And we back up what we sell with timely technical information via our ever-popular "Green Book" and periodic "how-to" technical bulletins. And we offer the best testing services in the industry! Make sure you monitor crop progress with our testing services for greenhouse and nursery media, field soils, water, fertilizer solutions and plant tissue! Click this box to request a copy of our "Green Book" Grower's Guide to Plant Nutrition. Click this box to request a sample. TotalGro has a water-soluble formula for every situation and every turf species. Use our general formulas for warm-season fertilization or our high-nitrate formulas for cool-season feeding. We make formulas for foliar-feeding and micro-feeding (micro-dosing), we make fertilizers for all seasons. Whatever your turf feeding needs are, we are certain you'll find what you need at TotalGro! 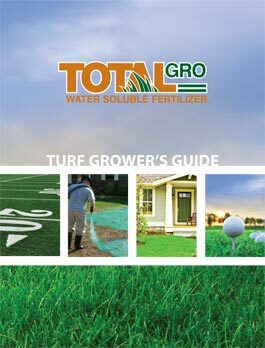 Our turf fertilization program is given in detail in our 2013 72-page "Turf Grower's Guide". Click this box to request a copy of our Turf Grower's Guide. TotalGro has been at the forefront of blueberry fertigation from the early years and has actually developed a special 27-9-18 high-ammonium fertilizer for field fertigation of blueberries. Other formulas are available to conform with soil test recommendations. We also provide for blueberry growers our acclaimed and comprehensive 36-page "Blueberry Culture Manual", first published in 2008. And of course, our premium-grade fertilizers are backed as always, up with soil, water and plant tissue testing services. 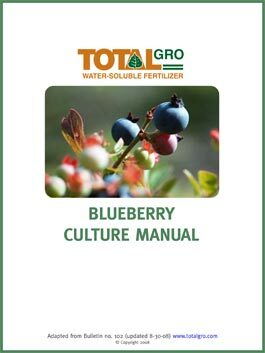 Click this box to request a copy of our Blueberry Culture Manual. 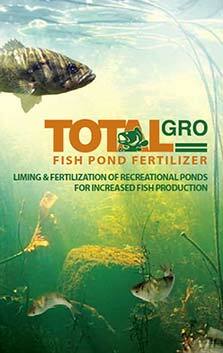 Fertilization (and liming if needed) assures optimum production of farm fishponds and TotalGro has high-phosphorus, water-soluble fertilizers designed for easy application and fast results. We even provide highly detailed information on when and how to use pond fertilizers for best results (Note: you shouldn't fertilize catfish ponds or any ponds where the fish are being fed). Since ponds respond best to well-limed waters, we can test your pond for water quality and for lime needs as well (call for details on how to take and submit samples). Click this box to request a copy of our Fish Pond Fertilization Manual.